Triangulation is a concept taken from navigation where you can calculate the location of a point by using 2 other known locations. In research, this means that you study something from more than only one standpoint. Research is not without flaws. Data is not without flaw. People aren’t without flaws. All research methods have their pros and cons. The problem arises when you only rely on one method, source, data set. 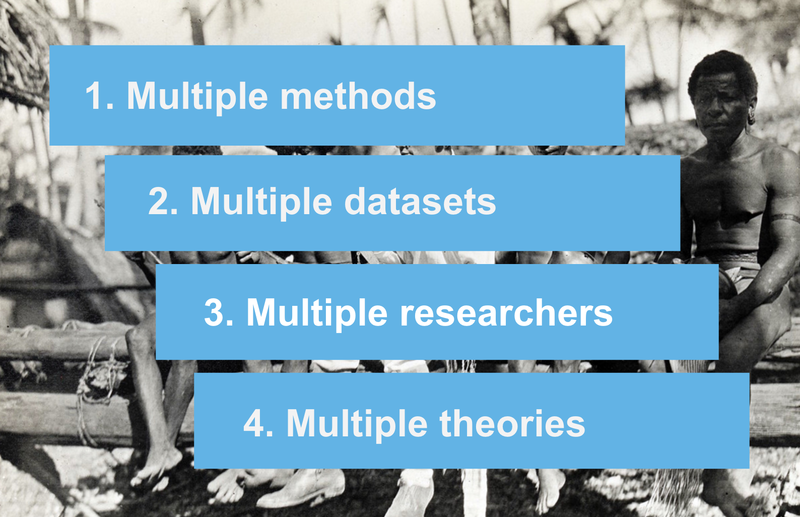 Using multiple methods simply means that you shouldn’t rely on one research method but use a combination of different ones to study the same thing. For example, use in-depth interviews with shadowing or observation. Use group workshops in combination with one to one interviews. Multiple datasets are slightly broader than the first. Data can be gathered from different sources, contexts, and points in time so try to combine different data sets. For example use web analytics, usability tests, and market research. Or do a questionnaire in the beginning of a test session and in the end to vary the time and context. Multiple researchers, especially if coming from different backgrounds will help to triangulate simply because they look at things in different ways. Using multiple theories goes hand in hand with the multiple researcher triangulation. If people come from different backgrounds they will frame the research problem based on different theories and so add several standpoints to your research. As said in the beginning, be critical and aware that bias can affect you and the people you study. Triangulation is not the holy grail but it will help to reduce bias in our next research project. Want to learn more about UX research? Learn more about assumptions vs. facts, research objectives, what research methods to use when, and how to write a one-page research plan in my crash course.